We love creating masterpieces with the hands the Good Lord has given us! Whether the masterpiece is a beautifully designed oak chest or a crayon drawing, everything made by our kids is precious. Learning to work with several different mediums allows our kids to gain confidence and expand their creative horizons. They have the opportunity to use tools and materials they may not have access to elsewhere. God is the Author of Creation and Craftmanship; what a blessing it is to share this gift with God the Father! Ø Woodworking is one of our favorites to do with kids and teens. We do simple, pre-prepped activities with our youngin’s, and advance to larger projects as the kiddo gets older/more skilled. Some of these projects may include constructing a birdhouse, designing a bench, creating a jewelry box, or even simply painting their favorite bible verse on an old fence board. We have wood burners, stains, and paints that the kids can use to make their creation uniquely beautiful. an Kid’s learn how to use certain tools safely and accurately. These kids will be practicing math skills (measurements & fractions), creative design, and the accurate communication of thoughts with newly learned vocabulary. Ø Ceramics is clay work which results in 3-D art. Right now, we have air dry clay and low-temp bake clay. Very soon, our program is receiving a donated kiln (high temp. firing oven). Eventually we will be getting a pottery wheel! Right now, Kids can create sculptures, ornaments, and display bowls/dishes. They learn the science behind ceramics! Once we get this program completely up and running with the tools mentioned above, our kids will be able to make beautiful pottery! Ø Sewing is art with fabrics! In this program, our kids start out with basic knowledge and practicing fundamentals while making simple potholders, pin cushions, and placemats. As they advance, our kids can make tote bags/purses, zipper pouches, clothes, quilts, wall-hangings, pillow cases, and more. We can even make accessories for our furry friends here at the ranch! Kids in this program practice math skills (measurements & fractions), creative design, following directions through patterns, and the accurate communication of thoughts with newly learned vocabulary (much like the woodworking program!). Ø We have tubs and tubs and tubs of yarn! Our kids can learn how to make wash cloths, beanies, scarves, and even blankets and clothes as they get more advanced. This program teaches kids patience, creative design, & fine-motor skills. Some of our youngins just like to make braided bracelets for their mommas and grandmas! Ø Beads, Beads, Beads! Shiny beads, big beads, microscopic beads – all these beads can be put on elastic, wire, or string to make necklaces, bracelets, earrings, anklets, hair accessories, and more! Our kiddos in this program learn bead patterns, creative design, patience, and fine motor skills. Many moms and grandmas love this program from the gifts they get from their littles! Ø Fine art includes drawing, painting, and creating on flat surfaces. We have acrylic paint, watercolor paint, and even oil and pastels for those who are serious. Our kids learn how to use different mediums, how they work, and how to control them to get the effect they desire. They will learn color & color mixing, shading, composition, balance, and more. For the kids who have doodles all over the margins in their school notes, they would love this program! Ø Repurposing is the art of utilizing materials not for their intended use. Tin cans? Make a bird feeder or a lantern! Plastic containers? Make a windchime! The possibilities are endless with repurposing. Ø Restoration is the art of making old/broken things functional and new again. For example, we get old furniture donated all the time – we can fix it, sand it, re-stain it, paint it, and even antique it further! Ø Popsicle sticks, cotton balls, glitter glue, and finger paint! We glue things together that probably shouldn’t be glued together, and we get messy and dirty – but don’t worry, we have aprons and soap! Our young one’s love getting creative with crayons (and melting them), feathers, rocks, twigs, Styrofoam, ribbon, and string. WE EVEN MAKE GOO AND PAINT HORSES! Have an Idea? Hop on board! WE LOVE VOLUNTEERS! Our program is growing rapidly, with plans of expansion! We need YOUR help in prayer, labor, and finances—Contact us! The cool morning wind on my face was made my heart leap in joy for the day ahead. I was on my bike on my way to my Grannie and Grandpa’s house, with my backpack packed with a water bottle, boots, gloves, and some fabric I bought with my own money. I was prepped for my day. I started the day feeding horses and doing chores with my Grandpa and helping my Grannie pull weeds and pick vegetables from her garden. We cooked the food she grew as meals for Grandpa and ourselves. Then, we would sew for hours on end. When the evening brought a cool breeze, we would ride horses until dusk. On my days at home, I would draw, paint, and make jewelry for family members. I did this consistently all the way from elementary through high school. The Lord was molding me from day one – even before I knew Him intimately. Now I work in a ministry that does all of this. 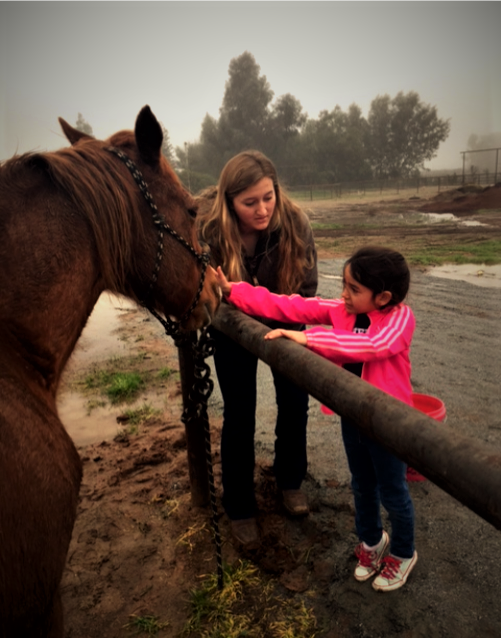 The Lord gave me a marvelous opportunity to be a full-time self-supported volunteer at Crown Valley Youth Ranch where I mentor kids and coordinate the Crafting Program. Glory to God in the Highest, for I am so grateful.